Aims: To describe the anatomy and the arrangement of the arachnoid trabeculae, pillars, and septa in the subarachnoid space of the human optic nerve and to consider their possible clinical relevance for cerebrospinal fluid dynamics and fluid pressure in the subarachnoid space of the human optic nerve. Methods: Postmortem study with a total of 12 optic nerves harvested from nine subjects without ocular disease. All optic nerves used in this study were obtained no later than 7 hours after death, following qualified consent for necropsy. The study was performed with transmission (TEM) and scanning electron microscopy (SEM). Results: The subarachnoid space of the human optic nerve contains a variety of trabeculae, septa, and stout pillars that are arranged between the arachnoid and the pia layers of the meninges of the nerve. They display a considerable numeric and structural variability depending on their location within the different portions of the optic nerve. In the bulbar segment (ampulla), adjacent to the globe, a dense and highly ramified meshwork of delicate trabeculae is arranged in a reticular fashion. Between the arachnoid trabeculae, interconnecting velum-like processes are observed. In the mid-orbital segment of the orbital portion, the subarachnoid space is subdivided, and can appear even loosely chambered by broad trabeculae and velum-like septa at some locations. In the intracanalicular segment additionally, few stout pillars and single round trabeculae are observed. Conclusion: The subarachnoid space of the human optic nerve is not a homogeneous and anatomically empty chamber filled with cerebrospinal fluid, but it contains a complex system of arachnoid trabeculae and septa that divide the subarachnoid space. The trabeculae, septa, and pillars, as well as their arrangement described in this study, may have a role in the cerebrospinal fluid dynamics between the subarachnoid space of the optic nerve and the chiasmal cistern and may contribute to the understanding of the pathophysiology of asymmetric and unilateral papilloedema. All the structures described are of such delicate character that they can not even be visualised with high resolution magnetic resonance imaging (MRI). The optic nerve is a white matter tract of the central nervous system that extents through the optic canal into the orbit. It is enveloped by the meninges and is surrounded by cerebrospinal fluid that enters the subarachnoid space via the chiasmal cistern. Anatomically the nerve can be divided into orbital and intracanalicular portions. The widest part of the orbital portion is adjacent to the ocular globe and is called the bulbar segment. It is followed by the mid-orbital segment (Fig 1). 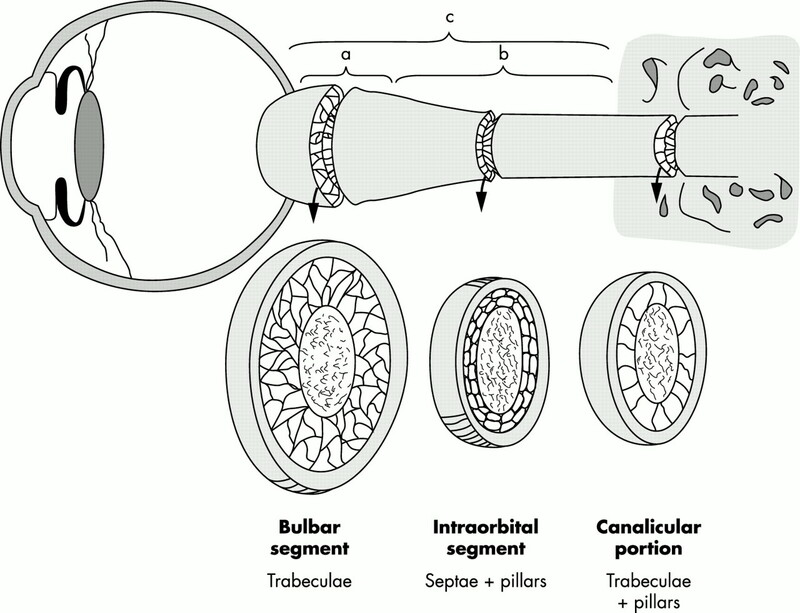 Schematic drawing of the optic nerve demonstrating the location of the (a) bulbar segment (containing trabeculae), (b) mid-orbital segment (containing septae and pillars), and (c) canalicular portion (containing pillars). The bulbar segment and the mid-orbital segment together form the orbital portion (modified according to Liu and Kahn13). In our previous investigation on the meninges of the human optic nerve, which demonstrated lymphatic vessels in the dura mater, we noted a difference in the type and distribution of arachnoid trabeculae in the different portions of the optic nerve.4 In the present study we focused on the architecture of trabeculae and septa in the subarachnoid space as well as on their relations to the different portions of the optic nerve. Owing to the “cul de sac” anatomy of the optic nerve, the cerebrospinal fluid dynamic in its subarachnoid space may be strongly influenced by the presence of trabeculae and septa. Knowledge on the precise anatomy of the strucures as well as their arrangement in the subarachnoid space may help to solve questions concerning the pathophysiology of asymmetric and unilateral papilloedema. The 12 optic nerves from nine patients used in this study were removed no longer than 7 hours after death following qualified consent for necropsy. Access to the optic nerve and the globe was obtained through the orbital roof. Before removing the globe, the subarachnoid space of the intracranial segment of the optic nerve was carefully injected with fixative using a 26 gauge needle. Subsequently, the orbital portion of the optic nerve and the globe were carefully dissected in situ from the surrounding tissues and the specimens were fixed with 2.5% glutaraldehyde (0.1 M cacodylate buffer). In two cadavers the optic nerves and globes were removed with the intact sphenoid bone in order to examine the intracanalicular segment of the nerve. The globe and optic nerve were fixed for at least 1 week in a solution of 2% glutaraldehyde (0.1 M cacodylate buffer). For examination of the intracanalicular segment the fixed specimens were decalcified with 0.5% HNO3 for 24 hours. Transverse sections of the bulbar, mid-orbital, and canalicular segment were then dehydrated in an acetone series, dried by the critical point method (CO2), mounted on aluminium stubs, and sputtered with gold (15 nm). The specimens were studied with an SEM 505 (Philips, Einthoven, Netherlands). Small fragments (approximately 1 mm3) were cut from the bulbar and mid-orbital segment and postfixed for 1 day within 1% OsO4 (0.1 M cacodylate buffer). Subsequently the specimens were dehydrated in a series of alcohol and embedded into Epon by routine procedure. Semithin sections (approximately 2 μm) were cut from each block and stained with toluidine blue to identify the meninges. Ultrathin sections (approximately 50 nm) were contrasted with uranyl acetate and lead citrate and studied with a CM 100 (Philips, Einthoven, Netherlands). The bulbar segment of the optic nerve showed a distinct enlargement of the subarachnoid space (ampulla) which was detectable even macroscopically. 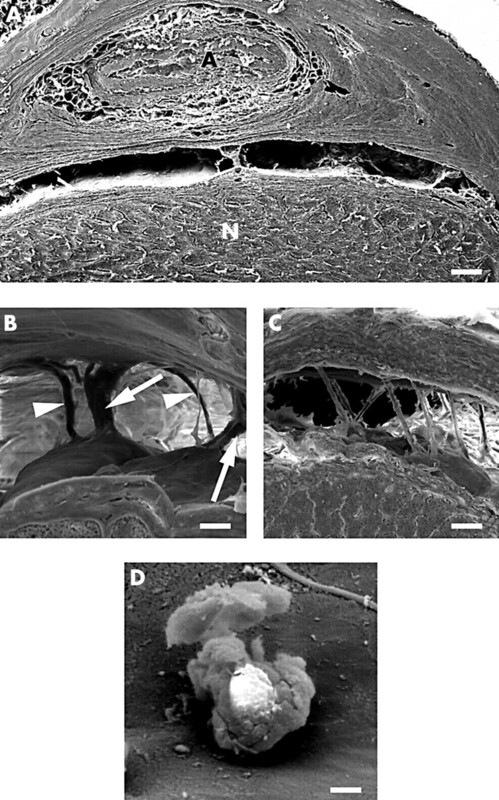 SEM examination revealed abundant round shaped arachnoid trabeculae bridging the subarachnoid space, which were anchored in the arachnoid and pia layers without broadening (Fig 2A). The trabeculae were often branched to form a delicate network (Fig 2B). The profile of the trabeculae varied between 5 μm and 7 μm. Thin lamellae of highly flat cells were located in a veil-like pattern between adjacent trabeculae. Occasionally, larger trabeculae containing one or two blood vessels were found within the trabecular network (Fig 2C). SEM appearance of the subarachnoid space in the bulbar segment. (A) Overview of the subarachnoid space showing the complex network of trabeculae. The arrows point to veil-like cytoplasmic extensions between adjacent trabeculae (bar = 150 μm). (B, C) Delicate subarachnoid space network formed by branching trabeculae (bar = 50 μm). The arrow points to a trabeculum with a blood vessel. Note again the veil-like cytoplasmic extensions connecting adjacent trabeculae (bar = 2 μm). Surface of trabeculae covered by flattened cells with distinct intercellular clefts and fenestrations (bar = 0.2 μm). Each trabecula was covered by flat leptomeningeal cells with smooth surface and slender processes (Fig 2D). The continuitiy of the cells was occasionally interrupted by intercellular gaps and fenestrations with a diameter between 0.2 μm and 1 μm. 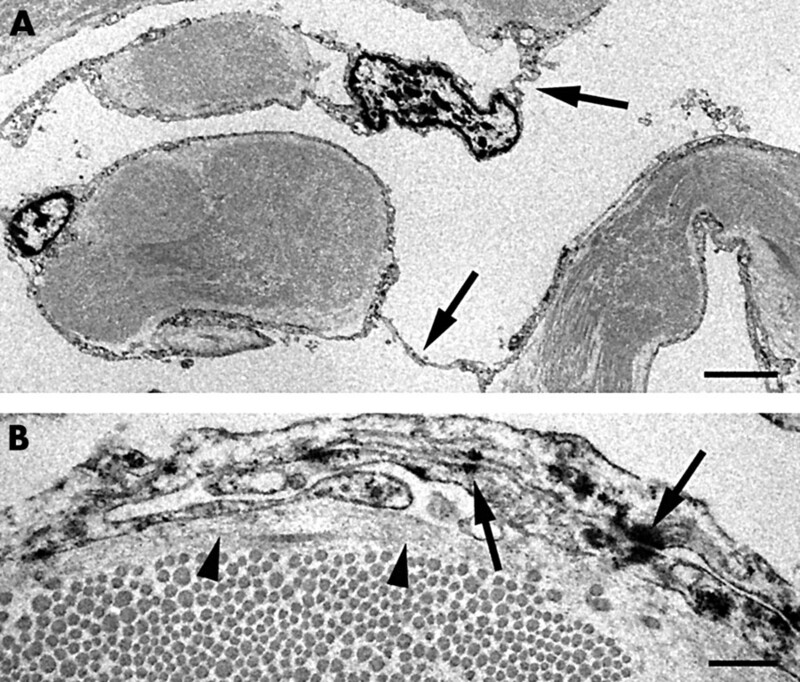 TEM revealed that each trabecula was surrounded by a complete sheath of leptomeningeal cells (Fig 3A). Adjacent trabeculae were connected by thin cytoplasmic bridges of leptomeningeal cells running freely through the subarachnoid space. The oval shaped nucleus of the leptomenigeal cells was rich in heterochromatin and protruded into the subarachnoid space. The leptomeningeal cells formed, with their slender processes, either single or multiple layers of surface lining cells (Fig 3B). In multiple layers the cells were attached to each other by well defined desmosomes. The size of the intercellular space varied distinctly and it was often widened forming small lacunae between leptomenigeal cells. The basal portion of the leptomeningeal cells was supported either by a fine fibrillar extracellular matrix resembling a basal lamina or by delicate collagenous fibrils in close contact with the cell membrane. The centre of the trabeculae was filled by densely packed collagenous fibrils which were arranged in small bundles (Fig 3A). Occasionally, single fibroblasts were detected within the trabeculae in close contact with the collageneous fibrils. Blood capillaries, lymphatic vessels, and nerve fibres were not present. TEM morphology of arachnoid trabeculae in the bulbar segment. The trabeculae are completely surrounded by arachnoid cells. (A) Note the thin cytoplasmic bridges (arrows) connecting adjacent trabeculae (bar = 2 μm). (B) At higher magnification multiple layers of cytoplasmic extensions from arachnoid cells are detectable at the surface of a trabeculum. Note the desomosomes (arrows) between the arachnoid cells and the broad basal lamina-like extracellular matrix supporting the leptomeningeal cells (arrowheads) (bar = 0.25 μm). The subarachnoid space was distinctily smaller than in the bulbar segment. It contained numerous broad septa running in various directions (Fig 4A and B). They divided the subarachnoid space into chambers that were connected to each other by large perforations within the septae and by interseptal spaces. In addition, single round shaped pillars were detecable which, in contrast with trabeculae, ended with broadened ends at the pial and dural surface of the subarachoid space and had a diameter of 10–30 μm (Fig 4C). Both septa and pillars were covered by flattened cells with smooth surfaces displaying numerous intercellular fenestrations of varying size (Fig 4D). 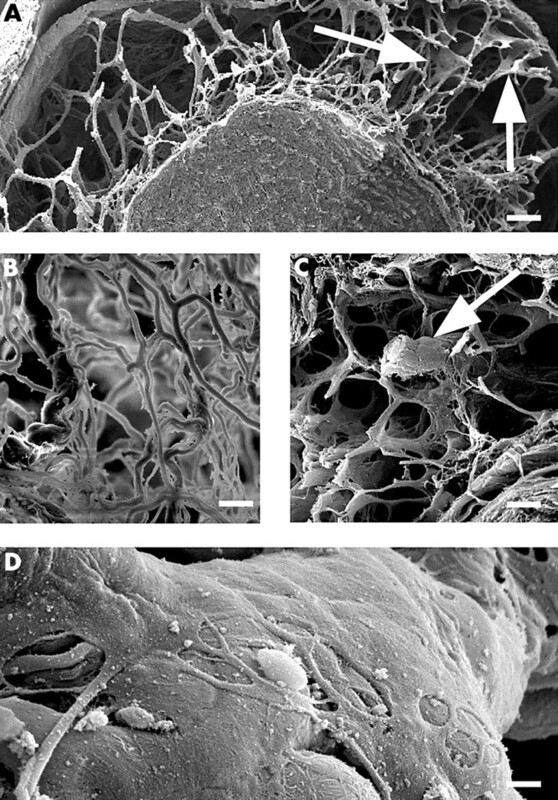 TEM morphology of leptomeningeal cells covering septa and pillars was comparable to that of trabeculae in the bulbar segment. They formed either single or multiple layers and were connected to each other by well defined desmosomes. The centre of the septa and pillars contained numerous collageneous fibrils and single fibroblasts but no blood vessels, lymphatics, or nerve fibres. SEM morphology of the subarachnoid space in the mid-orbital segment. (A) Overview of the subarachnoid space subdivided by well defined septa (arrows), N = optic nerve (bar = 150 μm). (B) Arachnoid septum within the subarachnoid space; note the septal perforations connecting adjacent subarachnoid space chambers (bar = 25 μm). (C) Pillar bridging the subarachnoid space and extending into the dura layer of the arachnoid (bar = 30 μm). (D) Detail of a septum with typical intercellular clefts (bar = 0.5 μm). Within the optic canal the subarachnoid space was continous over large distances (Fig 5A). The centre of the canal demonstrated one or two large pillars with a size of approximately 0.5 mm containing one or two blood vessels. The other parts of the intracanalicular segment showed either single pillars with a diameter of approximately 25 μm which expanded at the dural and pial attachment of the arachnoidal layer (Fig 5B), or delicate round shaped and slightly curved trabeculae of approximately 5 μm diameter (Fig 5C). At the orbital opening of the canal the trabeculae were more numerous running in parallel and bridging the subarachnoid space in oblique direction (Fig 5C). Again the surface of the pillars and trabeculae was covered by flat, smooth surfaced cells with small intercellular clefts. Occasionally single leucocytes were found closely attached to the leptomeningeal cells (Fig 5D). 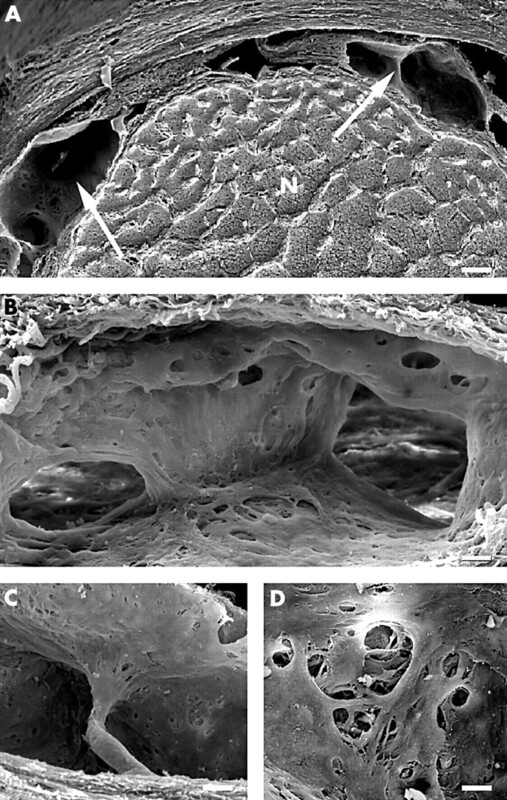 SEM morphology of the subarachnoid space in the intracanalicular segment. (A) Overview of the subarachnoid space; A = ophthalmic artery, N = optic nerve (bar = 15 μm) (the optic nerve is turned 180°). (B) Pillars (arrows) and trabeculae (arrowheads) transversing the subarachnoid space (bar = 30 μm). (C) Trabeculae within the subarachnoid space found at the orbital opening of the optic canal (bar 30 μm). (D) Leucocyte at the surface of a pillar in the intracanalicular segment (bar = 5 μm). The present study has used SEM and TEM to describe in detail for the first time both the fine anatomy of trabeculae, septa, and pillars in the subarachnoid space of the human optic nerve and their relation to location within the different portions of the nerve. The morphology of the cranial and spinal meninges and of the subarachnoid space have been described in previous studies on dogs, cats, rats, and humans.1–8 In order to find appropriate terminology for the structures transversing the spinal subarachnoid space, Parkinson used the terms arachnoid septa, trabeculae, and “rough strands.”9 A classification of cranial arachnoid trabeculae in stout, columnar or sheet-like types was suggested by Delmas.10 The same paper describes a close association of the trabeculae with blood vessels, a finding that also was confirmed by Alcolado.11 Detailed information on anchorage of the fibroblasts that form the arachnoid trabeculae in the arachnoid and the pia layer is provided by Haines.12 In contrast with the vast literature on the cranial and spinal meninges, there is a scant anatomical literature on the meninges of the optic nerve. In consideration of this anatomy the subarachnoid space of the optic nerve cannot be regarded as a homogeneous space filled with cerebrospinal fluid, but rather as a multichambered and subdivided tubular system with a blind end (cul de sac) behind the ocular globe. If the intracranial pressure rises because of an increase of cerebrospinal fluid, the fast and the slow axoplasic transport slow down and papilloedema can be observed in the ocular fundus.3,19 Since the cerebrospinal fluid is assumed to communicate between the different cerebrospinal fluid compartments a homogeneous pressure is postulated in all of these cerebrospinal fluid chambers. Our morphological study of trabeculae and septa within the subarachnoid space of the optic nerve provides strong anatomical evidence that the hydrodynamics between and within the different cerebrospinal fluid segments, especially within the subarachnoid space of the optic nerve, is more complex than within the ideal Bernoulli tube. Cerebrospinal fluid dynamics should therefore not simply be regarded as an undeflected continuum in a series of interconnecting chambers. Because the subarachnoid space ends blindly in the bulbar segment behind the globe, cerebrospinal fluid needs to reverse its direction of flow in order to return to the site of resorption. There is histological evidence for a cererbrospinal fluid outflow system into the dura of the optic nerve itself,4 however this cerebrospinal outflow pathway albeit helpful in maintaining the pressure within certain limits during movements of the globe and optic nerve, may not be sufficient to absorb enough cerebrospinal fluid during a rise in fluid pressure. The subarachnoid space of the optic nerve is at the lower end of the cerebrospinal fluid chambers and because of its cul de sac anatomy the pressure gradient points unidirectionally from the chiasmal cistern to the subarachnoid space of the optic nerve in the manner of a hydraulic pump. Pressure could therefore build up in this small anatomical compartment that ends blindly behind the globe. The authors thank W Moor (Institute of Pathology, Kantonsspital Aarau, Switzerland) for careful preparation of all the optic nerves used in this study as well as P Rosenbaum, MD (Albert Einstein College of Medicine, New York, USA), and Th Resink MD (Universitiy of Basle. Switzerland) for assisting with English language problems. We also thank Mrs M Erni for excellent technical help for SEM and TEM preparation. Special thanks to Duane E Haines, (Department of Anatomy, Universitiy of Mississippi Medical Center, Jackson, MI, USA) for many helpful and inspiring comments on the manuscript. Part of this work was supportet by the Rudolf and Fridl Buck Foundation. Anderson DR. Ultrastructure of meningeal sheaths. Normal human and monkey optic nerves. Arch Ophthalmol 1969;82:659–74. Hayreh S. The sheath of the optic nerve. Ophthalmologica 1984;189:54–63. Hayreh S. Pathogenesis of oedema of the optic disc. Doc Ophthalmol 1966;24:291–411. Killer HE., Laeng HR, Groscurth P. Lymphatic capillaries in the meninges of the human optic nerve. J Neuro-Ophthalmol 1999;19:222–8. Andres K. Über die Feinstruktur der Arachnoidea und Dura mater von Mammalien. Zeitschrift für Zellforschung 1967;79:272–95. Rascol M. Izard JY. Arachnoid and subarachnoid spaces of the vault of the skull in man. Acta Neuropath (Berl) 1978;41:41–4. Cloyd MW, Low F. Scanning electron microscopy of the subarachnoid space in the dog. J Comp Neurol 1974;15:325–68. Zenker W. Hüllen des Zentralnervensystes, Ventrikelauskleidung und Liquor cerebrospinalis. In: Benninghoff Anatomie, Urban & Schwarzberg. Band 2, 1994:s339–60. Parkinson D. Human spinal arachnoid septa, trabeculae, and “rough strands”. Am J Anat 1991;192:498–509. Delmas JA, Low F. Scanning electron microscopy of the subarachnoid space in the dog. J Comp Neur 1975;161:515–40. Alcolado R, Weller RO, Parrisch EP, et al. The cranial arachnoid and pia mater in man. :Anatomical and ultrastructural observations. Neuropathol Applied Neurobiol 1988;14:1–17. Haines DE, Harkey HL, Al-Mefty O. The “subdural” space: a new look at an outdated concept. J Neurosurg 1993;32:111–20. Liu D, Kahn M. Measurement on relationship of subarachnoidal pressure of the optic nerve to intracranial pressure in fresh cadavers. Am J Ophthalmol 1993;116:548–56. Braun JS, Kaissling B, Le Hir M, et al. Cellular components of the immune barrier in the spinal meninges and dorsal ganglia of the normal rat:immunohistochemical (MHC class II ) end electron-microscopic obervastions. Cell Tissue Res 1993;273:209–17. Persky B, Low F. Scanning electron microscopy of the subarachnoid space in the dog: inflammatory response after injection of defibrinated chicken erythrocytes. The Anatomical Record 1985;212:307–18. Milhorat TH, ed. Hydrocephalus and the cerebrospinal fluid. Baltimore: Williams and Wilkins, 1972. Bito LZ, Davson H. Local variations in cerebrospinal fluid composition and its relationship to the composition of the extracellular fluid of the cortex. Exp Neurol 1966;14:264–80. Wood JH, ed. Neurobiology of cerebrospinal fluid. New York and London: Plenum Press, 1982. Sanders MD. The Bowman lecture. Papilledema: the pendulum of progress. Eye 1997;11:267–94. Morgan WH, Dao-Yi Y, Cooper RL, et al. The influence of the cerebrospinal fluid pressure on the lamina cribrosa tissue pressure gradient. Invest Ophthalmol Vis Sci 1995;36:1163–72. Levy NS. Functional implications of axoplasmic transport. Invest Ophthalmol Vis Sci 1974;13:639–40. Fechtner RD, Weinreb RN. Mechanisms of optic nerve damage in primary open angle glaucoma. Surv Ophthalmol 1994;39:23–42. Quigley HA. Hohman RM, Addicks EM. Morphologic changes in the lamina cribrosa correlated with neural loss in open-angle glaucoma. Am J Ophthalmol 1983:673–91. Gass A, Barker, et al. MRI of the optic nerve in benign intracranial hypertension. Neuroradiol 1996;38:769–73. Jinkins JR. Optic hydrops: isolated nerve sheath dilation demonstrated by CT. Am J Neuroradiol 1987;8:867–70. Strominger MB, Weiss GB, Mehler MF. Asymptomatic unilateral papilledema in pseudotumor cerebri. J Clin Neuro-Ophthalmol 1992;12:238–41. Sedwick LA, Burde RM. Unilateral asymmetric optic disk swelling with intracranial abnormalities. Am J Ophthalmol 1983;96:484–7. Killer HE., Flammer J. Unilateral papilledema caused by a fronto-temporo-parietal arachnoid cyst. Am J Ophthalmol 2001;132:589–91. Marcelis J, Silberstein SD. Idiopathic intracranial hypertension without papilledema. Arch Neurol 1991;48:392–9. Green JP, Newman NJ. Stowe Z. “Normal pressure” pseudotumor cerebri. J Clin Neuro-Ophthalmol 1996;16:241–6. Killer HE, Mironow A, Flammer J. Optic neuritis with marked distension of the optic nerve sheath due to local fluid congestion. Br J Ophthalmol (in press).